Melt the chocolate bits and water either over low heat or approx. 30 seconds in a microwave – stir until smooth and set asideCombined flour, soda, powder and salt. Cream butter, gradually adding 1 cup of the sugar until light and fluffy. Add egg yolks and continue beating. Combine bananas, sour cream and vanilla. Add banana mixture into batter, alternating with flour, ending with flour. Stir in cherries and mini chocolate bits. Beat egg whites until soft mounds. Gradually add 1/2 cup sugar and beat until a bit stiffer. Place 1/3 batter in pan, spreading it out to cover bottom. Drizzle 1/2 of melted chocolate on top. Drizzle the balance of the melted chocolated. Place the last of the batter on top and spread out. Bake at 350 degrees for 50-60 minutes or until it springs back. Do no invert the cake put cool it in the pan. When cool, turn out, remove parchment paper and enjoy! NOTE: You can drizzle more melted chocolate on top if desired. 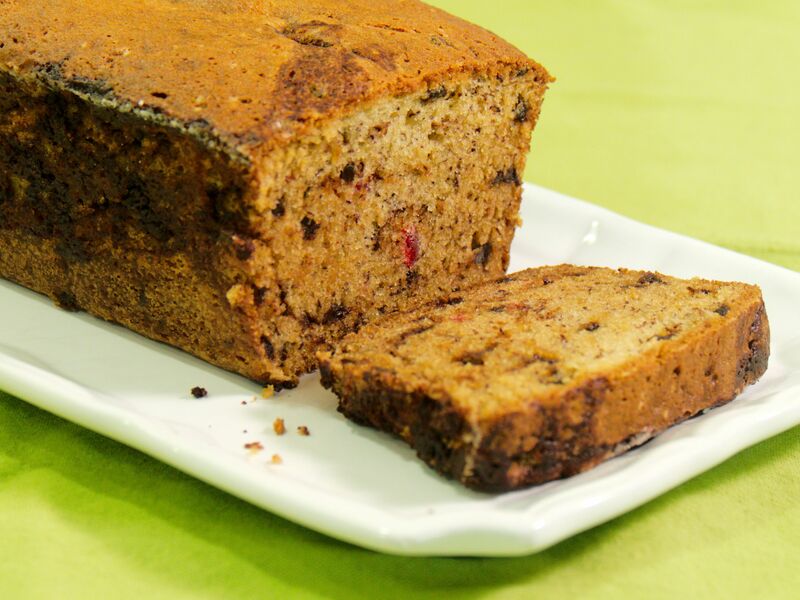 This entry was posted in Recipes, Videos and tagged Banana, Cake. Bookmark the permalink.